When they are both full grown. The running of the deer. Sorry I didn't post last week's menu plan. I promise we really did eat. At this point I am sure no one cares, and I never got them on the computer, so I'm just moving on. This week is my birthday, and the vegan is being less strict. I also plan to eat a lot of vegan leftovers when I do eat vegan, so I'm only posting the carnivore plans here right now. In honor of our celebration today of our Lord's birth, I wanted to post the traditional Christmas hymn of Joy To The World. September of this year found my family taking a late-summer vacation week in Chincoteague, Virginia. I posted about my trip in September. Eye See You, Africa is the first in a series of children's books dedicated to children and animals who share our planet. The book's Foreward is written by Jack Hannah, Director Emeritus of the Columbus Zoo, and Host of TV's "Into the Wild" and "Wild Countdown". My oldest children are in their 20's, and I remember Jack Hanna from children's television twenty or more years ago! In the book's pages we meet animals through first, the eyes, and an accompanying poem to give a clue as to the animal's identity. Having been an educator for over twenty years, what I did not expect was that I would meet animals I had never met before! "Rock rabbit" they call me when I hop about. To stay warm I use thick fur and SUN. but I'm friendly and just having FUN. So, the day I wanted to read this book, I sat down on the couch, and my big son sat down beside me, and for a few bittersweet moments I enjoyed a flashback to his younger days as he enthusiastically leaned against me and leaned in as I read aloud, and he guessed on each animal before we flipped the page to the reveal. Many of the animals we knew, and some we did not, and we were both surprised by the animals we had never "met" before. I graze wherever I PLEASE. and I can jump fences with EASE." What am I (my words)? I found this book would be great with emerging readers, learning their "sight" words. Each of the words I typed in capital are capital letters in yellow in the book. If my son had been a young reader, I would have paused at each word, pointed to it, and waited for him to try to read it. So, you're going to think I'm a stinker, but I'm not going to tell you what this animal is. I'd never heard of it! If you want to do a Google search you might eventually be able to find it, but wouldn't it be much nicer to buy a copy of this book for yourself? It is suitable for your home school, your class room, your library, your museum, wherever you interact with children! Eye See You, Africa can be used with children in ways that enhance studies in language arts, social studies, animal protection and environmental stewardship. The lines are written in rhyme (language arts). Animals are introduced from Africa (social studies), and you can make sure the children know or learn where Africa is located in the world. Learning about these African animals can be expanded to discuss endangered species (elephants, etc. ), and how their environment is being encroached upon, further endangering them (environmental stewardship). A portion of the proceeds of every copy of Eye See You, Africa will be donated to the Wilds, Save the Children, and the International Fund for Animal Welfare. Thanks to the universal appeal of the book, and to Dr. Jay's generosity, the Eye See You series has the potential to become a perpetual source of global philanthropic revenue for this and for generations to come. Eye See You, Africa is available at the Smithsonian Institute museums, but you can now purchase a copy on Amazon.com or from the website eyeseeyoubooks.com. Eye See You, Africa is priced at $24.95 (US). If you buy the book on Amazon, be sure to purchase a new copy so that donations will go to the charitable organizations that this series will support. My son and I thoroughly enjoyed this book, and I am forwarding my copy along to my niece so that she can share it with her sweet family. I know they (in Alaska) are going to really enjoy reading about these animals in Africa! Let me know what you think when you have read the book! Announcing IEW's 12 Days of Christmas Giving! Visit IEW.com/Christmas14 every day, 12/26–1/6, to receive the gifts we have for you, including downloadable products, audio talks, and some special surprises, all completely FREE. and register for daily email reminders. 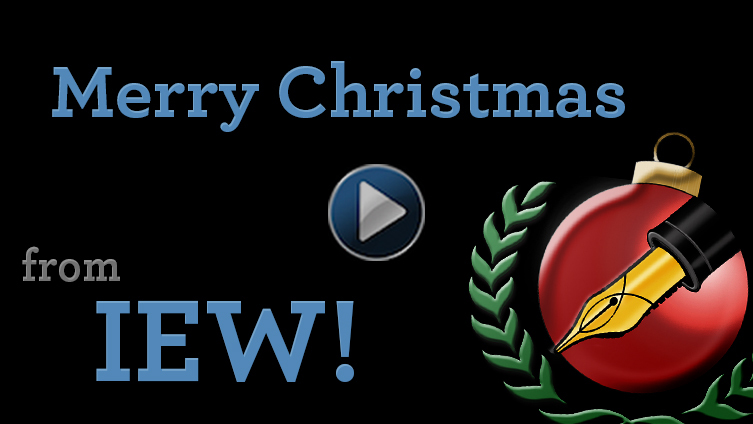 Gifts include downloadable products, mp3 talks by Andrew Pudewa, and some really special prizes. Even items they will ship to you all completely FREE. There is even a drawing each day for a complete set of the new Teaching Writing: Structure and Style! Share with your friends, and enjoy these wonderful gifts. I wanted to supplement our December hymn study with some really nice, traditional Christmas hymns. I chose to start with this hymn. The first piece is instrumental, so the 2nd one has lyrics.